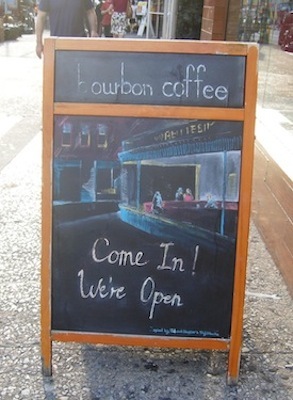 Bourbon Coffee is a café located at 43 West 14th Street in Manhattan, just west of Union Square. 14th Street is something of a thoroughfare, so I’ve passed their front door many times before; this time, however, I had to stop and take a quick picture of their sidewalk sign. It’s an homage to Edward Hopper’s iconic Nighthawks, complete with a credit line in the lower corner. I don’t know who the on-staff artist could be, but he or she did a nice job with this chalk sketch. 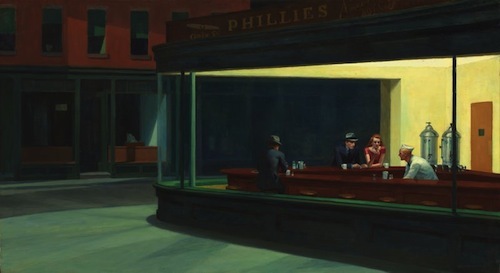 You’ve most likely seen a reproduction of Nighthawks before, but here’s an image from the Art Institute of Chicago website, where you can also learn much more about the painting. It occurred to me as I passed that Bourbon Coffee is only a few blocks’ walk from the site of Hopper’s longtime studio on Washington Square North. The exact location of the late-night diner that inspired this scene is unknown; most likely, Hopper created a composite of details borrowed from various restaurants he had visited in Greenwich Village. It’s a quintessential New York tableau, and its lack of a specific address makes it all the more timeless. 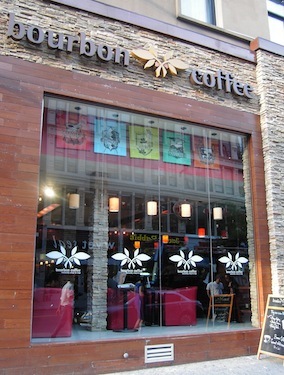 Here’s a shot of Bourbon Coffee’s facade. It’s a far cry from Hopper’s diner in terms of décor and menu—it’s also a lot busier—but it’s still one of the many downtown spots where a New Yorker can stop to be alone with his or her thoughts over a cup of coffee. Images: Edward Hopper’s Nighthawks (1941) via the Art Institute of Chicago; all photos by Tinsel Creation. Nice link to possible Hopper sites. But is anything in NYC ever that deserted?!? I think that’s what makes the work so appealing…it feels Twilight Zone creepy. Let’s get coffee! What a great catch! Of course I’ve seen that reproduction before but I don’t think I would have recognize it if I were to walk by that sketch. It would bother me though and I’d try to identify the source (at which point I’d probably read a credit line). Don’t take it as a self-promotion, I just thought you might be interested to take a look at this post. I’m curious which picture you’d choose (if you have time, of course, it’s not that important). In the text of the post there is a link to another one with more flowers/art pictures and in comments there is a ping-back to the answers to the puzzle. Hm… definitely the Sargent portrait of the woman in the pale dress wrapped in a brownish cloak, because that “matches” the construction of the flower arrangement. Fun! I’ve seen exhibitions like this at other museums, but I’ve never been to the de Young… alas. Yes, we have an edge for identifying art in obscure places! Put that on the resume!